AFA’s innovative curriculum for middle school string players is now in its fifth year serving graduating fifth through graduating eighth grade students. This half-day program, modeled on the established full-day orchestra/chamber music program, provides students with a thorough and challenging curriculum that culminates with two performances for the Houston community. 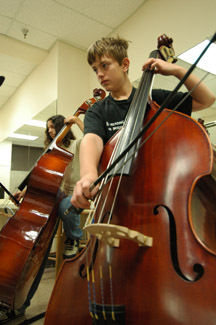 Orchestra emphasizes preparation, concentration, imagination and teamwork as part of the highest level of music making. In 2007 and dependent on enrollment, AFA will feature both Intermediate and Advanced orchestra for graduating 4th through 8th grade students. 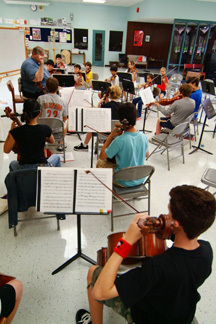 Placement in either the Intermediate or Advanced groups is made at the sole discretion of the AFA Middle School faculty and orchestral conductor. In both groups, students will take part in daily rehearsals of standard orchestral literature and new works. Chamber music students receive daily coaching from AFA’s outstanding faculty of clinicians and performers in quartets and quintets from the standard repertory. Chamber music workshops emphasize teamwork, active listening skills, communication skills and leadership as students work together to perform in a more individual context. A final concert for the AFA community gives students valuable performance experience in small ensembles. Musicianship class gives students in the middle school program a valuable context and framework for all of the skills they develop while in the program. 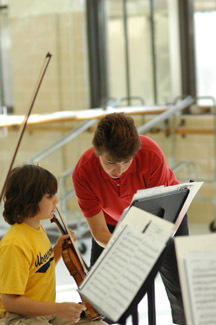 Featuring sectionals, technique classes, performance practice, music history and theory, students learn how every aspect of music frames their experiences as performers and interpreters of the music they play.